The Baao Children and Youth Choir will perform tomorrow at the Sixth Ani ng Dangal Awards Night at Newport Performing Arts Theater, Resorts World Manila. The choir, which is one of the choirs of the Barlin Choirs Organization of the Parish of St. Bartholomew the Apostle in Baao, Camarines Sur, was founded in 2003. Since then, it has received numerous accolades in international competitions, such as the 18th International Contest of Habanera Youth 2012 in Spain and the 9th Busan International Choral Festival and Competition in South Korea. Joining the choir for the awards show are other notable Filipino performers, such as the ABS-CBN Philharmonic Orchestra and Maestro Gerard Salonga. Ani ng Dangal is a state recognition given by the National Commission for Culture and the Arts under the Office of the President of the Republic of the Philippines. Among the Filipino artists who will be given recognition this year are Eugene Domingo, Melie Alunan, Jed Madela, Joel Torre, and Alessandra de Rossi. 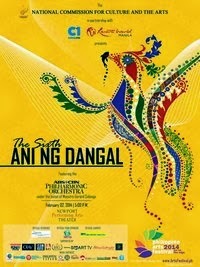 Ani ng Dangal is a free admission event, but registration is required as there are a limited number of seats. The awards show will begin at 5 o'clock in the afternoon.